Bosch has developed an electric axle claimed to cut the cost and development time for electric and hybrid vehicles, predicting “billions” of sales for the technology. Bosch says the e-axle could cut the cost and development time for electric and hybrid vehicles. 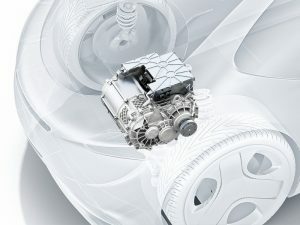 The company’s new electric axle packages the motor, power electronics and transmission into a single unit, which can be customised to vehicle manufacturers’ specifications and delivered to their production lines, helping to bring vehicles to market more quickly than developing similar components in-house. As the all-in-one design requires fewer copper cables, a simpler cooling system and no bearings, it’s said to be more affordable than separate components, as well as being lighter and more compact, which makes it easier to package into the vehicle. It’s flexible enough that it can be used in front or rear-wheel drive hybrid and electric vehicles, including light tricks. Despite its size, power output can be up to 402bhp, with 4,425lb/ft torque, and Bosch is claiming it can offer high peak output for fast acceleration, as well as strong continuous performance for high-speed travel. Mass production is planned for 2019, and prototypes are already under evaluation with vehicle manufacturers.